Out from under the thumb of the dastardly crew of the Wormwood and in command of a ship of your own, your fortune awaits inside the Pathfinder Adventure Card Game: Raiders of the Fever Sea Adventure Deck. 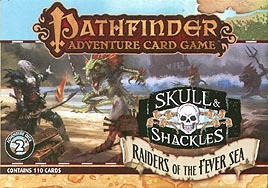 This 110-card expansion adds new locations, monsters, ships, villains and more to the Pathfinder Adventure Card Game; it also includes rare loot cards and 5 new scenarios that make up the complete Raiders of the Fever Sea adventure. Continue your character's legend with the Pathfinder Adventure Card Game: Raiders of the Fever Sea Adventure Deck.